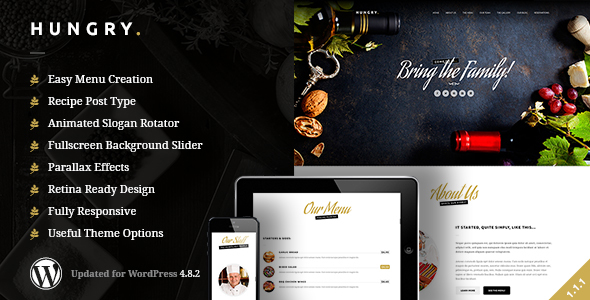 Hungry is a clean, simple, one-page WordPress theme that is ideal for any restaurant business. Its modern look, animated slogan rotator and fullscreen backgrounds are sure to be a hit with your potential diners! 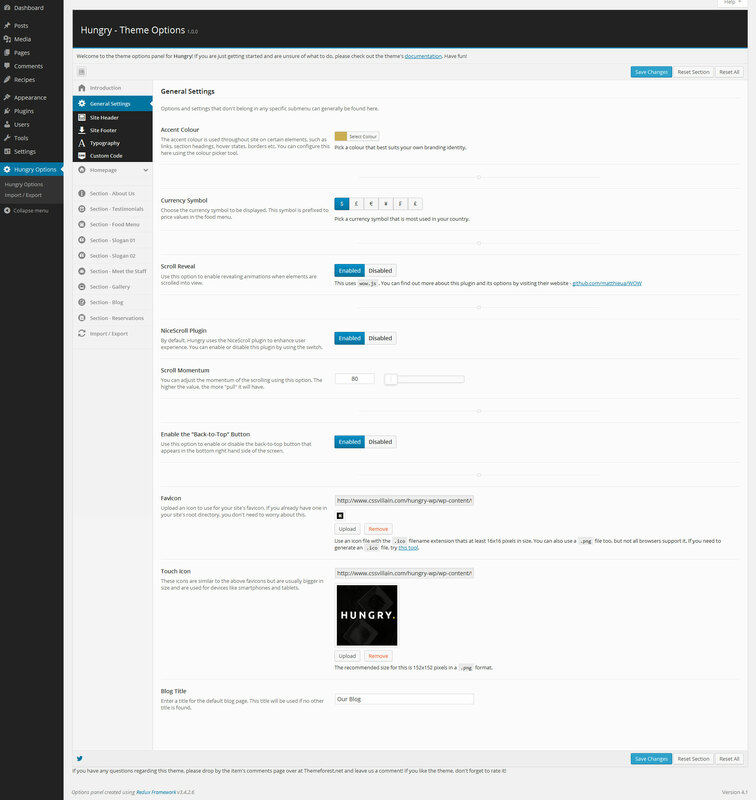 Easily manage recipes, menus and the appearance through custom post types and an intelligent theme options panel. Read on for more details or check out the Live Preview! Recipes in Hungry are super easy to manage thanks to WordPress’s custom post types. You can also assign your recipes to as many menus as you want. Display your menus with ease with a simple shortcode. You can use the Shortcode on any page or post. If you are not keen on using Shortcodes, there is also an easy-to-use alternative in the theme options panel available by dragging and dropping menus in different columns to suit your needs. All the sections you see in the demo are built into the theme and can be easily configured within the theme options panel. You can also add, re-order and remove these sections as you see fit by using a simple drag and drop interface. 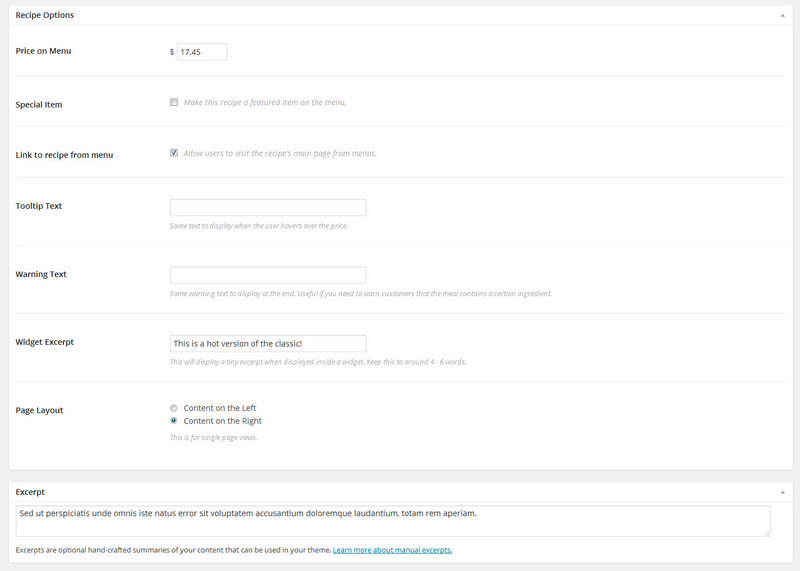 Custom sections are also supported too by using content from your other pages. Contact Details – Display your key contact details such as your email address, phone number, and business address. Opening Times – Let your visitors know which days you are open and the best times to visit. Latest Recipes – Your visitors can see what’s new on your menu! Hungry also comes with a powerful and robust theme options panel thanks to the Redux Framework. Configure the theme’s main elements such as the accent colour, one-page layout, right up to adding your own custom CSS and loads more! Hungry also works well with the Open Table Widget so you can integrate your site with Open Table’s website. Simply use a shortcode within the Reservation section and voila! Please note that you will need to buy the PRO version of the widget to use its shortcode and advanced features. Its available Right Here. NOTE: Most of the stock images seen in the demo are from Photodune.net and are Not included in the download package. - Added: Ability to use custom currency symbol. - Added: More theme options. - Updated: Custom Meta Boxes (CMB2) to the latest version. - Updated: Redux Framework to 3.6.0.5. - Updated: TGM Plugin Activation Class. - Moved: Theme Options into a Plugin. - Fixed: Some CSS issues. - Fixed: All Theme Check errors. - Added: More currency symbols. - Added: Menu descriptions for each menu. - Added: Each menu has its own ID in the Markup. - Removed: Favicon settings. Now handled by the WordPress customizer. - Removed: wp_title. Now handled by WordPress. - Improved: Custom sections now have the slug name instead of ID number for nicer URLs. - Improved: Font Awesome icons added to social icons dropdown list. - Improved: Slider images now stay centered and are more responsive. - Changed: Currency field is now a regular text field. - Fixed: Bug in one of the slogans. - Fixed: Warning notices when trying to show slogan backgrounds.